Since the initial release of the Timestone Internet Ordering System (IOS), it has been possible to offer items as "options" to products. A customer has been able to select a package then select options to be applied to the various products in the package. It stands to reason that items can only be offered if the software can find them when the job is uploaded! Items must therefore be in a path or paths that apply to the job being uploaded. For items to be available as options in IOS they must be in a path that applies to the job in question. In tsAdmin it is possible to specify a path as being for . Items may be in a path with other templates and the path must be flagged as available to "All" or to "IOS only". Items in an "Apps only" path will not be uploaded and therefore not presented to the user as options. Furthermore items even when offered will not be applied to any image holes that have been marked with the "Image without item design" option. In addition if the image hole already has been set with an explicit item design then it cannot accept items in IOS. In the original IOS release, ALL items in relevant paths were offered to ALL products in ALL packages. This could sometimes lead to confusion for the end user - it made no sense to be applying a bookmark item to a Trader Card layout for example. Since the initial release of IOS a number two methods have been introduced for controlling which items are offered online as options. It is possible to not offer items on a package by package basis. This is achieved in tsAdministrator. The default setting is to offer items to all packages. 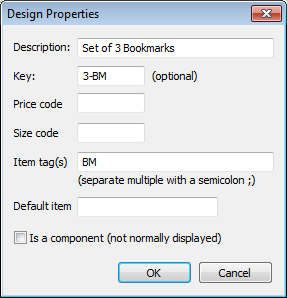 Beginning with Version 4.2 it is possible to link items to specific layouts by the use of matching tags. Items will only be offered to products if the item's tag and the layout's tag match. 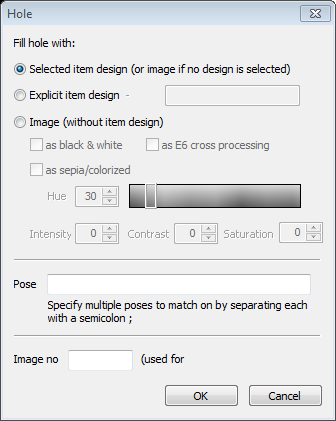 This allows the photographer to control which items are offered on a product by product level rather than have all items offered to all the products in a package.